A total of 552 billion won ($493 million) has been earmarked for opening 66 public libraries and 114 small libraries, the Ministry of Culture, Sports and Tourism said Wednesday. The move is part of the government’s “Library Development Comprehensive Plan,” set for 2009-2013 to promote reading. The 552 billion won includes a 188 billion won budget from the central government, 349 billion won from local governments and 15 billion won in private investment, the ministry said. The culture ministry will spend 83.5 billion won, the education ministry 26.2 billion won, and the defense ministry 7.3 billion won. The education ministry’s budget will be spent for more books for students at public schools’ libraries, while the defense ministry will improve infrastructure of military libraries. Gyeonggi Province, where 20 of the 66 new libraries will be located, will spend 98 billion won, while the Seoul Metropolitan Government will allocate 86 billion won for eight libraries, the culture ministry said. 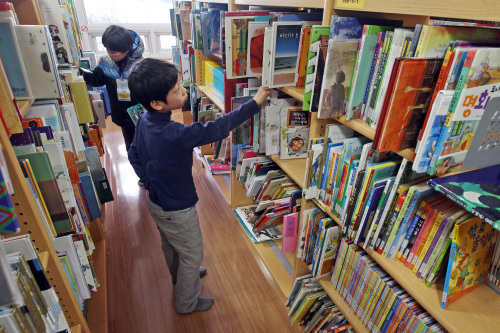 The government plans to boost the total number of public libraries in Korea to 814 in 2011 from 748 in 2010, with the number of public librarians increased to 3,470 in 2011 from 3,258 in 2010. To improve service quality, the ministry will increase the number of libraries per head of population. It aims to have 62,000 visitors per library in 2011, compared to 68,000 in 2010, the ministry said. While Korea had 70,000 visitors per library in 2009, the United States had 33,000 and France, 14,000. The government also aims to increase the number of books available at public libraries to 80 million by 2013. 올해 도서관 사업에 5천500여억원의 예산이 투입돼 180개 도서관이 확충되고 470여만권의 장서가 늘어난다. 대통령 소속 도서관정보정책위원회는 26일 발표한 2011년도 도서관발전종합계획 시행계획을 통해 올해 국고와 지방비, 민간투자를 합쳐 5천526억원을 도서관 사업에 투입한다고 밝혔다. 우선 공공도서관 66곳, 친서민 생활문화공간인 작은도서관 114곳 등 180개 도서관을 신설해 공공도서관 1곳당 인구 수를 지난해 6만8천명에서 올해 6만2천명으로 낮추기로 했다. 또 공공 도서관 장서를 470여만권 새로 확보해 1인당 장서 수를 1.3권에서 1.4권으로 높이고, 학교도서관의 학생 1인당 장서 수도 16.4권에서 18권으로 늘릴 계획이다. 이와 함께 16개 시도 공공도서관 사서 인력 212명을 충원하고, 해외학술데이터 베이스 16종에 대한 국가 라이선스를 확보하는 한편 대학도서관 외국학술지 지원센터도 7곳 운영키로 했다.